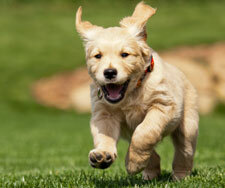 Does your dog have what it takes to win the Tahoe Donner I-Did-A-Run? Whether you're entering your pooch in the competition or just want to see the fur fly - this fun competition is bound to be full of excitement. Taking place on March 13 starting at 1 pm (registration starts at 12 pm), this sled dog competition features four different weight groups - and each dog will try to pull a weighted sled down a snow-covered chute the fastest. Awards will be given out for each weight category, with a trophy for the very fastest canine. Entry is $20 per dog, and every entrant receives a goodie bag. After you've had your fill of furry fun, return to our nearby resort and relax in your comfortable suite. We offer from a wide array of lodging options, from our cozy Lodgette to the spacious Townhouse. All of our units are equipped with top amenities including free Wi-Fi, microwaves, refrigerators, coffeemakers and sleeper sofas. Suites with balconies, wood burning stoves, and washers/dryers are also available. Are you interested in learning more about nearby ski resorts, the Tahoe Donner I-Did-A-Run, or other Truckee things to do? Please don't hesitate to contact us at your convenience at 1 (855) 979 0402 for more information or to book your reservations. Plan your ski escape today!